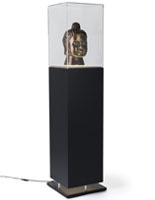 This pedestal display cabinet with lighting is perfect for showcasing museum artifacts or featured collectibles in an upscale retail store. 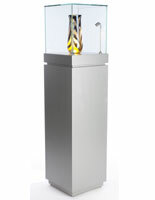 This case features LED illumination spilling out the bottom of this glossy white base. 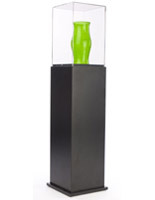 This sleek display cabinet with lighting makes a modern statement in upscale environments. 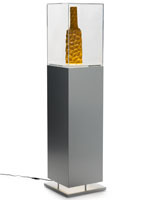 The acrylic lift-off top keeps the enclosed items from dust and fingerprints. This cabinetry with its contemporary square design is less expensive and lighter to carry than tempered glass units. 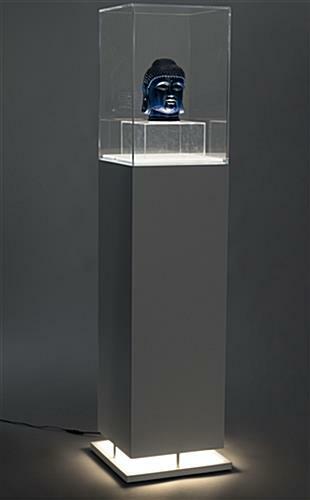 This case offers ample space for displaying objects of art, but takes up a small footprint due to the tower-like design. 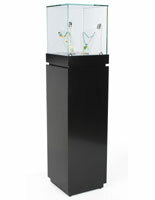 This cabinet with lighting is a great store fixture for showrooms and museums or any room with displayed items to show. The plug can be removed when the cabinetry is not being used.